The Seventh Annual Pinot Noir Shootout is a series of focused tastings by a diverse panel of experts and included 270 Pinot Noirs from around the globe including Canada, Chile, France, Italy, Australia and New Zealand. Stateside, California dominated the wine submissions, but some examples came from Oregon, New York, Michigan and even Idaho. 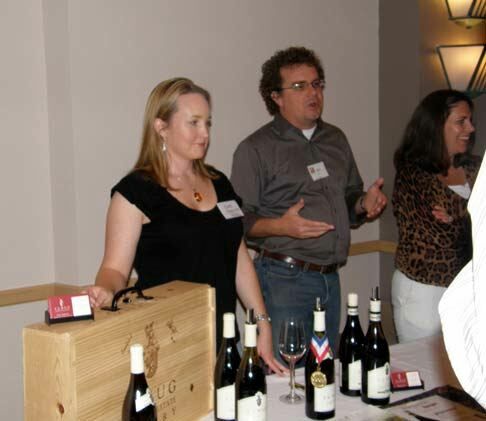 The Pinot Noir Summit is the final showdown, the culmination of the Pinot Noir Shootout. During the series of Shootout tastings, only 32 wines are tasted by the judging panel daily (four flights of eight wines each), allowing the judges to be completely immersed, focused and fair to the submitted wines and eliminating palate fatigue as a factor. The wines are tasted blind without reference to origin, appellation, vintage or price. At the Pinot Noir Summit, the judging panel’s top 44 wines are paraded blind for the consumer and press attendees allowing them to compare their findings with the expert panel. The Pinot Summit is the only wine competition in which judges’ conclusions are put to the test by an unbiased group of wine lovers. In addition, the preferences of male and female judges and attendees are tabulated separately for comparison. The two genders (not surprisingly) rarely agree on the best wines. 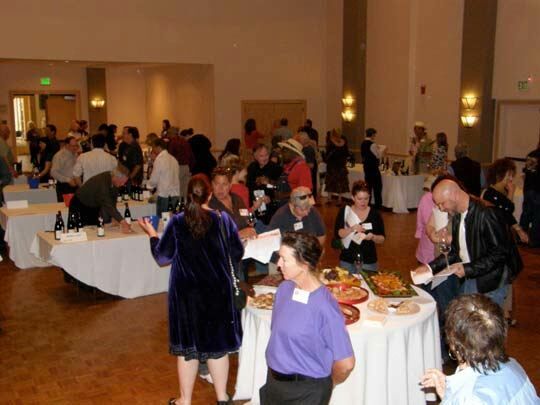 The full results of this year’s Pinot Noir Summit, held on Sunday, April 5 in San Rafael, California, are posted online at www.affairsofthevine.com. I blind tasted all 44 Pinot Noir finalists, powering through them in about two and a half hours. Because of the time limitation, my tasting notes are succinct and my recommended wines are based on a brief glimpse of each wine. I have put the wines in four groups according to my personal taste preferences: Excellent (would buy), Good (might buy), Decent (would drink if someone else buys) and The Rest. Remember that these wines are all finalists and represent technically sound wines that at least some members of the judging panel recommended. 889 cases, $50. Winemaker Dave Dobson crafted this wine but he has recently departed and has been replaced by Mark Beringer, formerly of Duckhorn. This wine is composed of the most outstanding barrels in the cellar and generally needs time to shed its tannins. · Deep dark reddish-purple color. Appealing aromas of plums, currents and spice. Plush core of earth-kissed dark fruits and sassafras with exotic spices. Less tannic than the 2006 version of this wine with a little more lively acidity. 172 cases, $40, sold out. A family owned winery founded in 1983 by Claiborne (Clay) Thompson and Fredericka Churchill Thompson and located in the Edna Valley of California. This producer has gained renown for its Alsatian wine varieties including Riesling, Gewürztraminer and Pinot Gris but Pinot Noir has also become a signature wine. Look for the 2007 edition of this wine which is sold through the Wine Club, Tasting Room and by phone order (805-544-4066). I also sampled the 2007 Edna Valley Pinot Noir ($26) and it is a killer as well. The winemaker is Coby Parker-Garcia. · Lighter in color and body, this elegant wine has appealing aromas and flavors of red cherries, vanilla and spice. Nothing out of place and no rough edges. Pinotypical. 5,557 cases, $30. 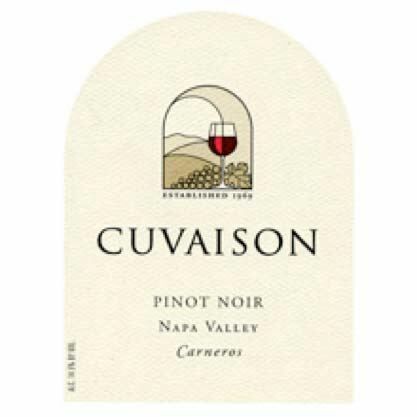 Cuvaison produces Pinot Noirs exclusively from its 400-acre vineyard in Carneros. The winery has been owned by the Schmidheiny family of Switzerland since 1979. A new winery devoted to Pinot Noir was built in Carneros and completed for the 2004 vintage. A tasting room on site is open by appointment. Steven Rogstad has been the winemaker since 2001 and he has consistently produced masterful Pinot Noirs. He also crafts the Cuvaison Block F5 Pinot Noir, a more intense expression of the winery’s Carneros fruit. The wines are available on the website and widely distributed. · Appealing mix of loamy and spiced cherry and berry aromas with impeccable balance. The tannins are silky, the richness is evident but understated, and the whole package drinks smoothly. 10,854 cases, $42. This historic winery now turns out 60,000 cases of wine a year but still manages to produce consistently fine Pinot Noir sourced from multiple appellations throughout California. Bonded in 1964, the winery uses a unique collaborative approach to winemaking involving David Bruce, a team of winemakers headed by Mitri Faravashi, vineyard manager Greg Stokes and the sales and marketing director. The wines are widely distributed. · A very tasty wine that is black cherry-driven with nicely appointed new oak spice running through. The tannins are fine-grained, the mouth feel is satiny and the lengthy finish is embellished with lively acidity. 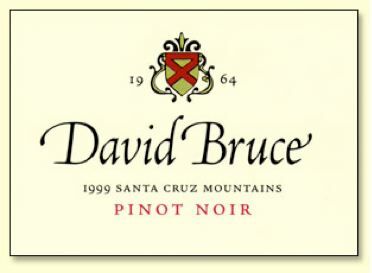 David Bruce is a California Pinot Noir icon. Unlike many physicians who enter wine at or near retirement, Bruce jumped in when he graduated from Stanford Medical School. It was a bottle of Richebourg from France that inspired him to buy 40 acres of land near Los Gatos, California in 1961. He cleared the land by hand, built a small winery and planted 25 acres of vineyards. He did double duty for 25 years, working in his dermatology practice in Santa Clara and spending his free time making wine. He was influenced by Martin Ray, who was a legend in the Santa Cruz Mountains winemaking community. Bruce instituted many technological advances in California winemaking many of which were learned from his trips to Burgundy. These included small barrel fermentation, whole berry fermentation for red wines, use of French oak barrels, foot punch downs, extended maceration and use of rotary presses. He was one of the first California winemakers to produce a Blanc de Noir, a white Zinfandel and late harvest wines. He became well known for his Petite Sirah. 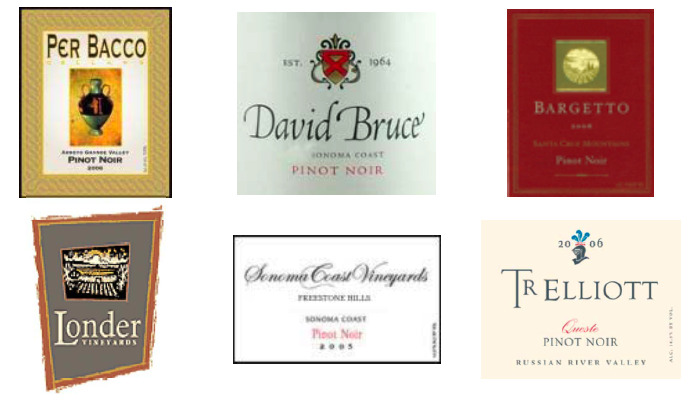 Bruce's early work with Pinot Noir was fraught with difficulties (he called Pinot Noir the Dune of winemaking referring to the science fiction novel) but he persisted and his Pinot Noirs eventually earned him an international reputation. He was one of twelve California wineries that participated in the 1976 Judgment of Paris. For more historical information on David Bruce, consult The David Bruce Winery: Experimentation, Dedication and Success (2002 interview), Regional Oral History Office, The Bancroft Library, University of California, Berkeley at www.archive.org/details/davidbrucewinery00brucrich. 14.8% alc., 500 cases, $48. This newer winery was extensively reviewed in the PinotFile (Volume 7, Issue 14). I have tasted this wine blind twice and on two other occasions with consistent findings. Available only at the winery through a mailing list. · Dark stone fruits and strawberries are featured highlighted with cinnamon spice and oak with a suave texture and nicely balanced t n’ a. Beautifully harmonized. 30,000 cases, $10, screw cap. The price is not a misprint. This was a surprising find at the Pinot Noir Summit. The representatives who were pouring the wine were not well informed and the website doesn’t reveal much information, but then, that is the whole idea behind this Pinot Noir. Just drink it, don’t dissect it! The wine is one of 25 labels of Trinchero Wine Estates, apparently from estate vineyards in Monterey and “the Delta.” This is an “anti-snob” wine and the website, wwwjargonwines.com, encourages the use of plastic cups. 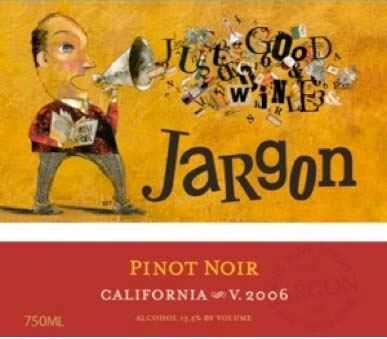 The name “Jargon” is a stab at the prevalence of pretentious wine-speak, a condition the producers term “jargonitis.” The 2006 vintage is widely accessible in retail stores and the 2007 vintage will be more available soon. · This is about as easy going a Pinot Noir as you will ever find. Bright red fruits, juicy and delicious, with a soft and smooth mouth feel and no tannins in sight. Not a nuanced wine and lacks complex aromas and flavors and a lengthy finish but it is a lovable wine that is well-crafted. In simple jargon: a good drink. 2,200 cases, $40. This is reliable Central Coast producer of Pinot Noir, Chardonnay and sparkling wine who has fared well in past Pinot Summit events. Available now from the winery’s website. · Restrained but pleasant dark berry and cherry pie aromas with a healthy core of well-spiced black cherry and blackberry fruit that fans out nicely on the palate and finishes with persistence. Very user-friendly. 14.5% alc., 217 cases, $45. This is the high-end label from Hahn Estates in the Santa Lucia Highlands (see feature later in this issue). This wine represents a special selection from small blocks of Lone Oak Vineyard crafted by winemaker Paul Clifton. Aged in 50% new French oak. · This beauty has a vibrant black cherry fruitiness with interesting notes of coffee and leather. Very plush and velvety in the mouth with a fresh, lively and lengthy finish. Evocative and very satisfying. 13.5% alc., 662 cases, $36. This wine is crafted by Michael Cox who is also the winemaker at Schug Winery in Carneros. A blend of 80% Iund Vineyard (30 year-old vines) and 20% Sangiacomo Tailgrass Vineyard (15 year-old vines). Aged 15 months in 34% in new French oak. · Strawberry red in color. Pleasing aromas of black cherries, berries and grass. Demure flavors of cherries, cranberries and a touch of toasty oak all in harmony with admirable grip on the vibrant finish. 500 cases, $36.95. The Nth Degree wines are limited production handcrafted wines from Wente Vineyards. Fifth generation winemaker, Karl D. Wente, creates these wines to reflect the terroir of Wente family’s Estate Vineyards. The wines are allocated and sold primarily to wine club members with very limited restaurant and retail availability. 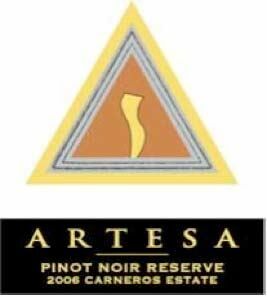 The Nth Degree Pinot Noir is 95% Pinot Noir (Arroyo Seco, Monterey) and 5% Barbera (Livermore Valley). 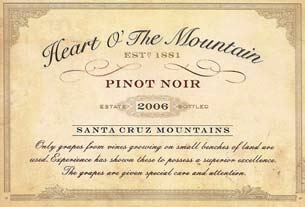 The Pinot Noir was aged 16 months in a combination of French, Eastern European and neutral oak. The Barbera was aged in stainless steel tank (50%) and American oak (50%) for 3 months. Very cool looking package. 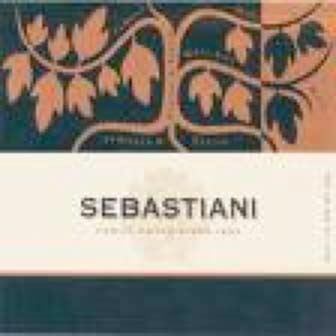 · I love this wine for its pinotypicity. Delicate dusty red fruits on the nose with a juicy cherry mouth filling attack. Flavors of clove and cola add interest. The tannins are supple and the aromatic finish is endless. I can’t say enough good things about this wine. 350 cases, $40. Proprietor and winemaker Toby Hill is making his mark in the Anderson Valley with beautifully crafted and limited production vineyard-designated Pinot Noirs from Mendocino County. Hill is an artist as well and his labels are very eye-catching. 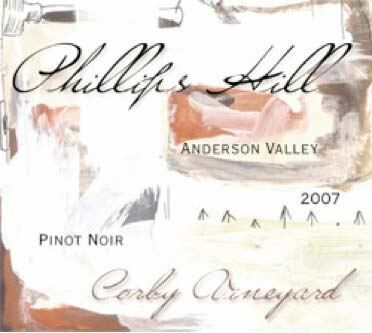 The wines are sold through a mailing list wine club and the Phillips Hill tasting room in Philo on Highway 128. · A thoroughly satisfying cherry-driven Pinot that is well-spiced, lightly weighted, with perfect integration of tannins and acid. This wine really shows off the bright and juicy Anderson Valley fruit that pinotphiles love to come home to. 14.4% alc., 120 cases, $55. French immigrant Roger left a distinguished career in the restaurant industry to start RN Estate in 2005 in Paso Robles. He crafts a number of varieties including Pinot Noir from Fiddlestix Vineyard in the Santa Rita Hills and Maridel Vineyard in Avila Valley. This wine is composed of Dijon clones 113, 115 and 667. It is aged 12 months in French oak. Nicolas has a gifted touch with Pinot Noir and I have been an admirer since the first release. The wines may be ordered online and are distributed to fine wine shops and restaurants in California. · Floral and confected dark red fruit aromas. Tasty sweet red plum and black cherry flavors matched to toasty oak. Beautifully composed with healthy tannins and admirable restraint. Drinkable now but will benefit from a year in the bottle. 14.0% alc., 75 cases, $44. Owner and winemaker Ken Dunkley produces artisan Pinot Noirs from bought fruit at CrushPad in San Francisco. Ken began making wine in 1976 while a student at University California Davis and has had a career in fermented foods and drinks. 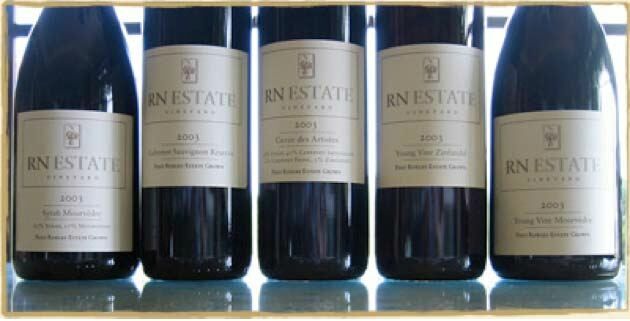 He started his commercial wine venture in 2006 and has already won awards in major wine competitions. Unfortunately he will not have access to this fruit in future vintages. 100% de-stemmed, 25% whole berries, 4-day cold soak, aged in 25% Francois Freres oak barrels for 9 months. Unfined and unfiltered. Sold on the website. · Moderately deep garnet color with a very slight cloudiness. Very sensual aromatics featuring darker fruits and Asian spices. Lushly fruited, mouth filling plum flavors. 27,287 cases, $18. A Sonoma County Selection. Wide retail distribution. · Slightly cloudy. Lovely nose of bright cherries and berries, sandalwood and stylish spice. Clean and balanced with great purity of fruit, suavely textured, a deft touch of oak, finishing with commendable grip. Amazing quality considering the sizable production level. 170 cases, $39.95. A blend of 8 Pinot Noir clones. 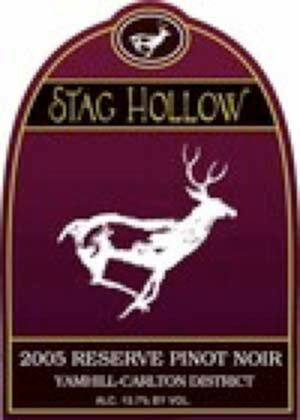 This small, family winery was started in 1994 by Mark Huff and Jill Zarnowitz in Yamhill, Oregon. The 34- acre estate is slowly being planted to vines on steep south-facing slopes of Willakenzie soils at very high density, exceeding 3,000 vines per acre. 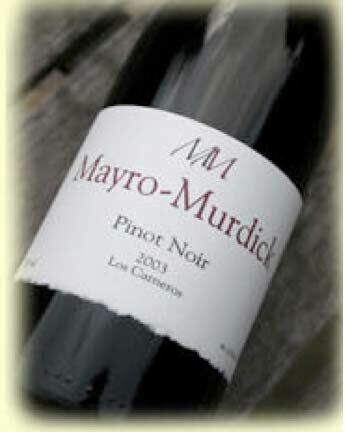 There are nine clones of Pinot Noir, including 5 Dijon clones. 10 acres of the estate have been designated as a wildlife preserve. The Pinot Noirs have been quite distinctive and praiseworthy. This wine won a Double Gold Medal at the Wine Press Northwest Judging in 2008. The wines are sold on the website and through retail channels. · Dark ruby color. Enticing aromatic profile of black cherries, plum, stems and cedar with a delicious and generous infusion of dark fruited reduction sauce matched to tasty oak. Substantial chewy tannins portend a long life ahead. 14.5% alc., 535 cases, $35. Available on website. · Ruby color. Perfume of crushed red berries with a touch of smoke. Juicy demure red fruits with supple dry tannins and a tangy lift to the pleasing finish. $25. One of the oldest wineries in the Santa Cruz Mountains, established in 1933. This wine is available on the website. · Light garnet in color. Attractive aromas of cherries and baking spice echoed in the flavors with a touch of savory herbs. The spectacular nose trumps the flavors. 13.5% alc., $28. Sourced from Laetitia Vineyard. Aged 12 months in 50% new French oak. Available on the website. · The nose draws you in with scents of bright black cherries and brioche. A mid-weight wine with cherry cola flavors and a deft touch of toasty oak. The dry tannins are caressing and the acidity is in step with the fruit. $42. A very popular wine with both the judging panel and attendees of the Pinot Summit. Winery (call) and retail availability. · Enticing aromas of dark stone fruits nicely accented by spice and cola. Saucy red fruits saturate the mid-palate and dry tannins provide a good backbone. The fruity finish teases but ends a bit short. 14.0% alc., 513 cases, $49. Aged 11 months in 40% new French oak. Unfined and unfiltered. Website availability. · Very dark reddish-purple in color. A big wine that attacks the senses with an onslaught of black cherry, baked plum, spice box and peppermint aromas and prodigious dark fruits, clove and tar flavors. Still young and brooding. A little heat peaks out on the finish. 250 cases, $55. Call winery for availability. · Lighter garnet color. Bright cherry and roses on the nose with juicy cherries and berries on the palate with harmonious integration of t n’a and age related mellowing. A perfectly fine drink. Unlabeled, unreleased. Crafted by winemaker Anthony Austin who makes wine for a number of wineries including Sonoma Coast Vineyards and Churchill Cellars. A favorite of attendees at the Pinot Summit. · Deep, dark reddish-violet color. A big Caliesque wine with vigorous flavor and character featuring a dark fruit profile and notable oak throughout. Very savory. 120 cases, $35. Crafted by Bob Cabral from a small high school vineyard. A collaboration between the Russian River Valley Winegrowers Foundation and El Molino High School. Available at www.rrvwfoundation.org. · An elegant and well-composed wine of great charm. Complex aromatic profile featuring violets, roses and herbs with flavors of Bing cherries and spice. No rough edges. 524 cases, 14.9% alc., $54. A reserve blend intended for the cellar. Aged 9 months in French oak. 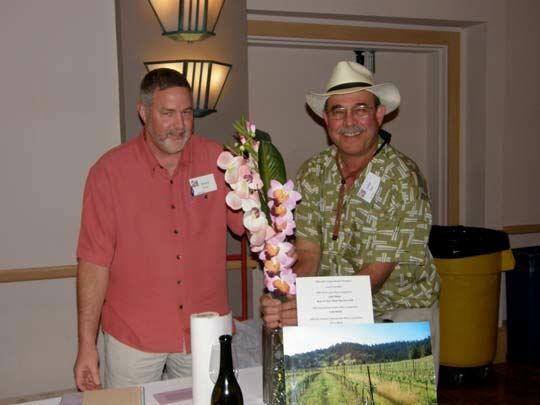 Winemaker is Rick Davis (Calstar). Available on the website. · The nose is rather reserved with faint black fruit jam and herbal notes. Very tasty black cherry and blackberry fruit with hints of cola and brown spice. Viscous and very smoothly textured. 430 cases, $40. Winemaker is Jay Buoncristiani. Check Buoncristiani Wine for availability. · Aromas of berry and cherry compote laced with vanilla and cream. Plush and fruit-driven flavors with a soft pillowy texture and a short finish. 7,387 cases, $28. This wine is sold on the website. · Enticing scents of Bing cherries, strawberries, and cedary oak. Decent core of red fruits kissed by savory herbs. Plush in the mouth and velvety in texture. 14.2% alc., $45. · Available on the website. Red plums and black currants with a spicy and earthy undertone. Bright acidity on the refreshing and lively finish. 10,000 cases, $29.99. Imported to the U.S. by Broadbent Selections, Inc., San Francisco. · The dark side of Pinot Noir. Intense aromas of crushed plums and grapes. Plenty of sweet purple fruit and well-managed dry tannins. 14.4% alc., 315 cases, $38. Sourced from Hallberg Vineyard and O’Connell Vineyard. Clones 115 (80%), 777 (10%), Elite (5%) and Pommard (5%). Unfined and unfiltered. Another bottling, Queste, is sourced entirely from Hallberg Vineyard, contains significantly more Pommard and is quite good as well. The wines are available on the website. 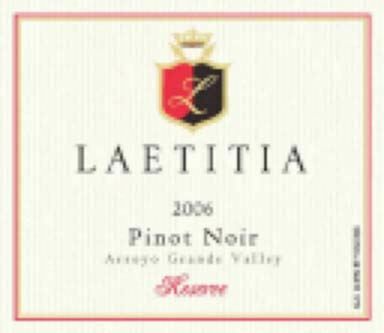 · Wonderful aromatics typical of Russian River Valley Pinot Noir featuring Queen Anne cherries, strawberries, baking spices and a touch of oak. Red fruits are flanked by earth, mocha and tobacco notes with well balanced tannins and acidity. Quite enjoyable. 14.0% alc., 250 cases, $45. · Wood kissed red fruits including cherries and cranberries. Soft tannins, brisk acidity but somewhat flat on the finish. $28 · Deep reddish-purple in color. Shy nose offering red plum and forest floor scents. On the palate the dark fruits are loamy, almost chalky. 1,770 cases, $26. · Medium garnet color. Very attractive fruity nose alive with fresh cherries and wild berries. Lightly weighted red fruits on the palate framed by stem notes and moderate tannins. 63,500 cases, $18. · Middleweight cherry-driven aromas and flavors with forest floor, oak and citrus accents. Substantial tannins dwarf the fruit. 150 cases, $47. · Oak and herbs dominate the nose. Tight with dry red fruits, noticeable oak and dry tannins. 415 cases, $45. · The flavors trump the aromas at this stage. Demure Pinot fruits which are quite vibrant and juicy with moderate tannins. 1,130 cases, $36, screw cap. · Fresh aromas of dark red cherries, spice, cola and mint. Flavors of dusty red cherries and a hint of oak caramel and spice. Richly flavored but not jammy and some persistence on the finish. 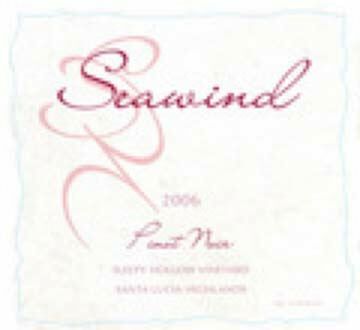 2006 Adobe Road Sonoma Coast Pinot Noir 1,350 cases, $39. 2006 Fess Parker Bien Nacido Vineyard Santa Maria Valley Pinot Noir 1,950 cases, $55. 2006 Olson Ogden Russian River Valley Pinot Noir 283 cases, $42. 2006 Paritua Central Otago Pinot Noir 600 cases, $35. 2006 Sand Hill Durell Vineyard Sonoma Valley Pinot Noir 216 cases, $55. 2006 Stephen’s Encell Vineyard San Luis Obispo County Pinot Noir 350 cases, $30. 2006 Willowbrook Cellars DuNah Vineyard Sonoma Coast Pinot Noir 190 cases, $44.